Republican National Committee Chairman Michael Steele tried to energize his party today with the announcement that the RNC is sponsoring a "Fire Pelosi" bus tour this fall. 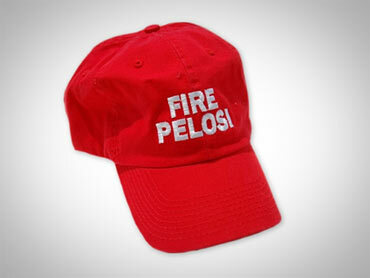 Steele appeared at the RNC convention in Kansas City, Missouri with a red "Fire Pelosi" cap on, the Associated Press reports. "Get on the bus!" he yelled on stage, next to a cardboard bus that read, "Need a job? Fire Pelosi." Republicans are expected to win back a number of House seats this November, but it remains to be seen whether they are capable of tacking back the majority -- especially when Democrats hold a financial advantage. "We can't rest now," Steele told the committee, AP reports. "Everything we've been doing, and all that we must do, needs to be ramped up and maxed out in the next three months." He added, "Sleep? What's that? We can't sleep until November 3rd." At the convention, the RNC finalized its plans to hold the 2012 GOP convention in Tampa, Florida, and it set the presidential primary calendar to begin in February 2012. Steele urged the party to remain united and avoid distractions, though he did not mention the distractions he has caused for the party, the New York Times reports. Last month, Steele created a controversy by calling the Afghanistan war a "war of Obama's choosing." "We all know that our journey to this point has not been easy and that the road ahead will surely test us - test our resolve, test our ability to remain united," Steele said today.